At the end of December, I participated in the Daytona CBC (Christmas Bird Count). A stretch of beach was part of my group’s area, most of which we could cover by car. As we drove along four-plus miles of beach, I counted the gulls and terns, while others in the group counted shorebirds and other species. Among the shorebirds we found a couple of flocks of Red Knots. One of the birds was banded and flagged. I took some photos of the distant bird in rather poor drizzly conditions — and was pleased to later see that the flag’s numbers were readable. I reported the sighting on bandedbirds.org and was amazed to find much data about this particular bird’s movements was immediately available to me. No waiting for a response, awesome! Red Knots have one of the longest migrations of any bird species. Birds in the western hemisphere may travel over 9000 miles, twice a year, between their breeding grounds in the Arctic to their winter homes in southern South America. The rufa subspecies of the eastern Americas is emperiled, in great part due to its reliance on the availability of horseshoe crab eggs during a critical part of its migration. These birds are the subject of the excellent Nature episode Crash: A Tale of Two Species. The bird we saw on the CBC was first banded during spring migration, on June 3, 2005, in New Jersey. Since then, this hearty Red Knot has been sighted several times. During the following spring, it was seen again in New Jersey. The next sighting was in the fall of 2009, where FLV5M* apparently spent (at least) nearly two months on the coast of Georgia. Sightings in South Carolina and again New Jersey followed. 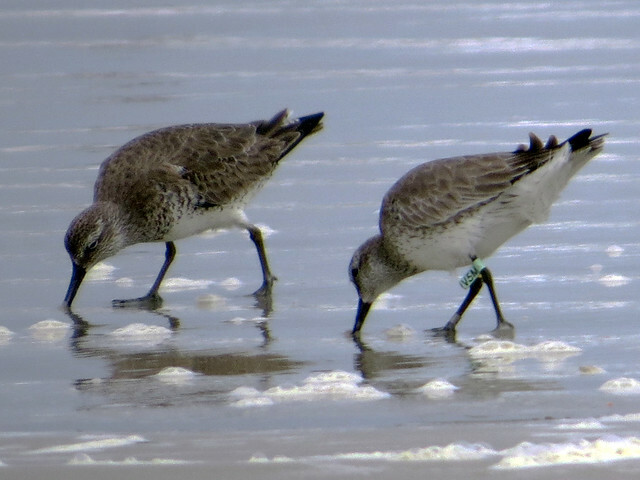 In March 2011, the Red Knot was captured again (this time in South Carolina) and had its flag replaced (*to the present FLV5M). Sightings continued to come in from New Jersey, Georgia, South Carolina, and once in Delaware. The first Florida sighting was reported at Ormond Beach in January of 2013. Our CBC sighting at Daytona Beach on December 28, 2013, was the first reported December sighting for this bird. 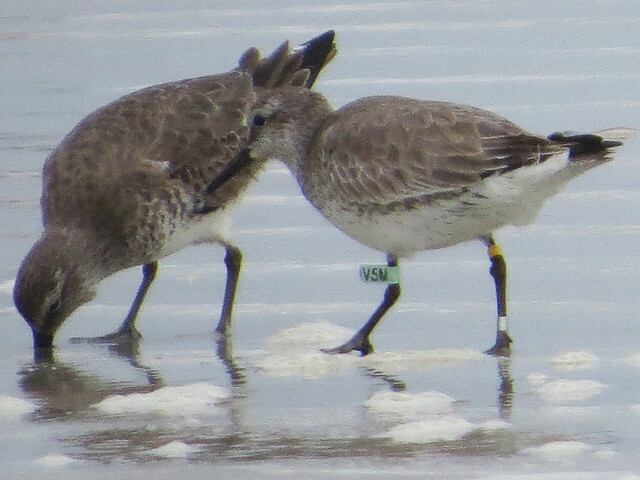 Between its first capture in 2005 and our sighting in December 2013, Red Knot FLV5M had traveled well over 145,000 miles, and possibly many more. All on its own power. Red Knots weigh less than 5 ounces. Isn’t that amazing?! 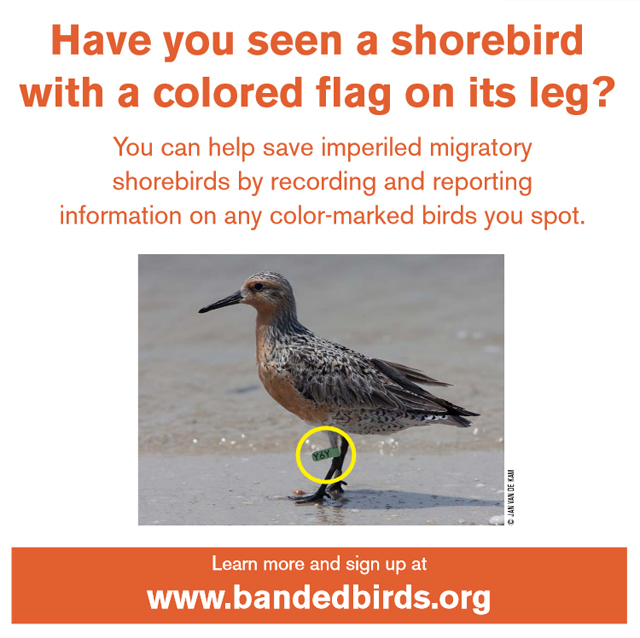 If you’ve ever seen a flagged shorebird, be sure to report your sighting! In North America, other species of banded birds can be reported to the Patuxent Wildlife Research Center Bird Banding Laboratory. If you aren’t able to read the entire band, your sighting may still be useful. Do a web search for your species and banding efforts; that’s what I did when I could only partially read the band of a Reddish Egret Arthur and I found on the Keys a couple of years ago. This entry was posted in Banding, CBC, Florida, Migration. Bookmark the permalink.